When we pitched up at this year’s Offshore Wind Connections conference with a bed, we never imagined quite so many people would end up getting #InBedWithRapid. But the thought of snuggling under the covers with our friendly Business Development Director, Linda went down a storm. Everyone who came along to the conference, which took place at the Double Tree Hilton in Hull, loved the idea of finding out how we could help their business. 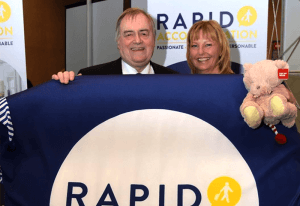 In fact, as well as many of the visitors and delegates cozying up beneath our specially designed duvet, Linda was even joined by former Deputy Prime Minister, John Prescott. It’s not everyday you find yourself in bed with a Lord, but it just goes to show that here at Rapid Accommodation…we’re certainly going up in the world. It’s one of the reasons we were so keen to attend #OWC2018 this year. The event was a great opportunity to share our exciting new look and plans for the future, and it was great to get to meet so many clients, new and old, face-to-face. We were glad to be able to tell so many people at the conference why it’s such an exciting time for us here at Rapid Accommodation and how we’re looking forward to helping so many new clients with their business accommodation needs this year. If you’d like to talk about how we could help take care of your next business trip, just give us a call on 0330 090 41 42. Or just look out for our Linda hiding under the duvet at a conference near you!